Each year, we find new and unique ways for parents, teachers, and students to help us fundraise for our school. Whether you shop on Amazon, use Kroger for your groceries, or like to go the extra mile and head to one of our events, we try to make fundraising easier. If you would like to purchase a pair of elastic lace please put five or six dollars per pair of laces and check off the pair of laces you’d like to order. 52” Y-Ties are on sale for $5.00/pair and 72” long laces for boots are on sale for $6.00 per pair. 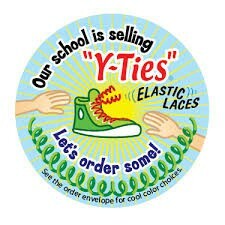 With the purchase of Y-Ties your child will receive a set of stickers and a copy of My First Y-Ties commix.